Art appreciation: A brief encounter with the Vielo V+1 | theraceforthecafe.com . 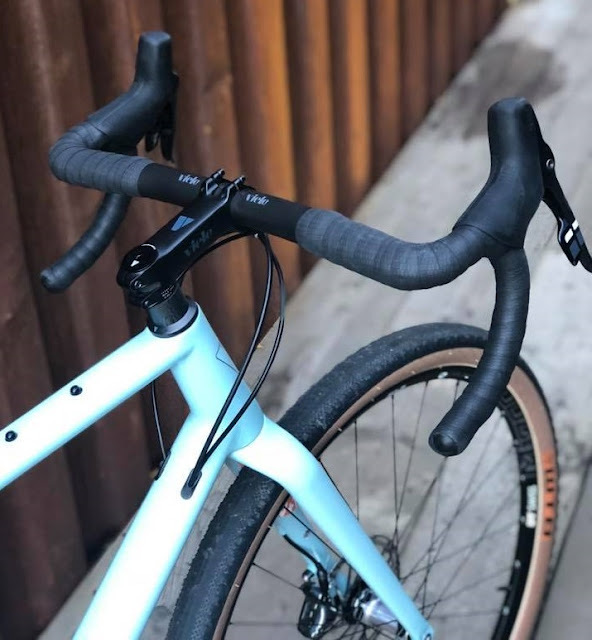 The cycling market is evolving rapidly and one of the things driving the change is that a lot of buyers now want a bike that is tailored towards what they really want to do. 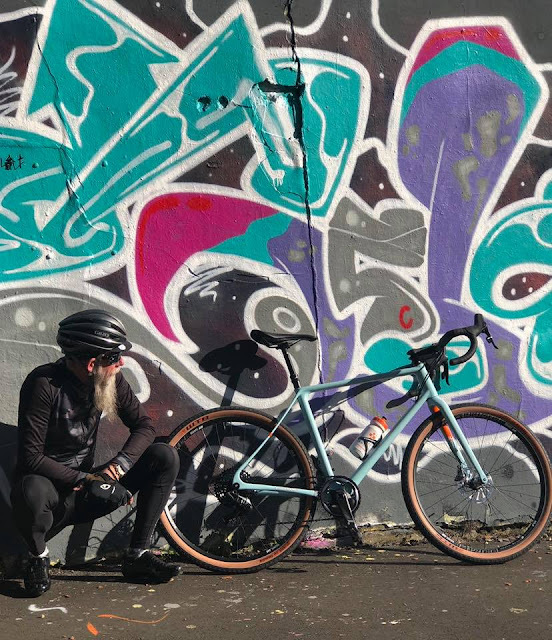 At a time when pro racing and bike racing in general are becoming less relevant for a lot of people discerning buyers now want a bike that is not just different, they want a machine that opens up a whole new way of cycling for them, a bike that actually changes their riding. For those riders who want to experience a bit of everything there are now an increasing number of options. 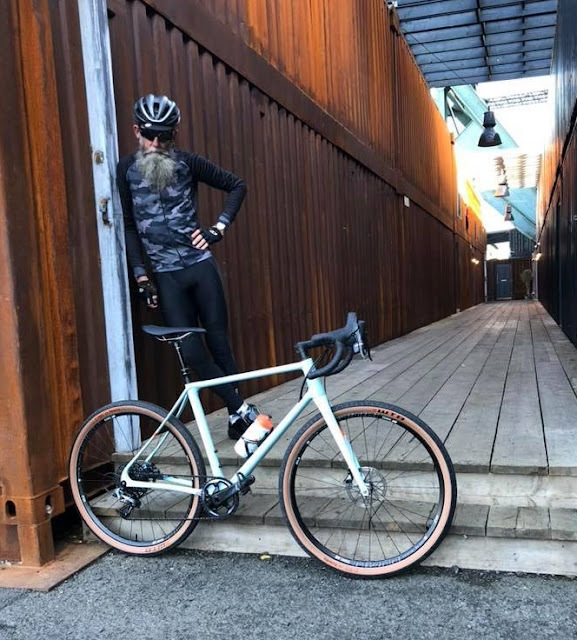 Of course a big part of the fun of cycling is going fast, so performance is still key and a bike that allows you to cover a lot of ground quickly over all types of surfaces is now the ideal for many serious cyclists. 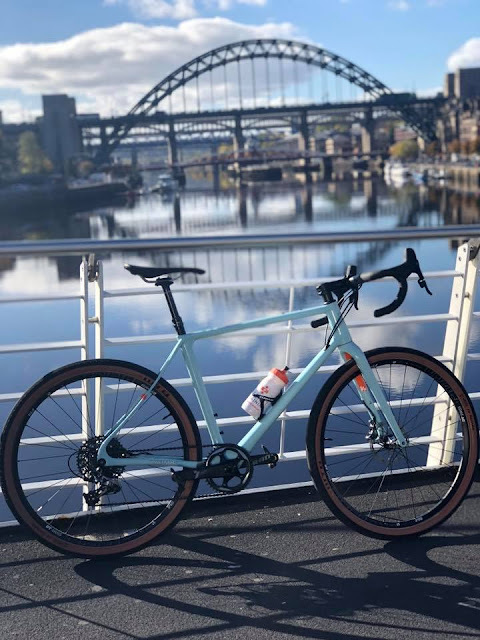 Generally speaking in this sector it's not the big brands but the small companies that lead the innovation and last month I went to visit one such company and to test ride a very special bike, the V+1 from Tyneside based enterprise Vielo.cc. 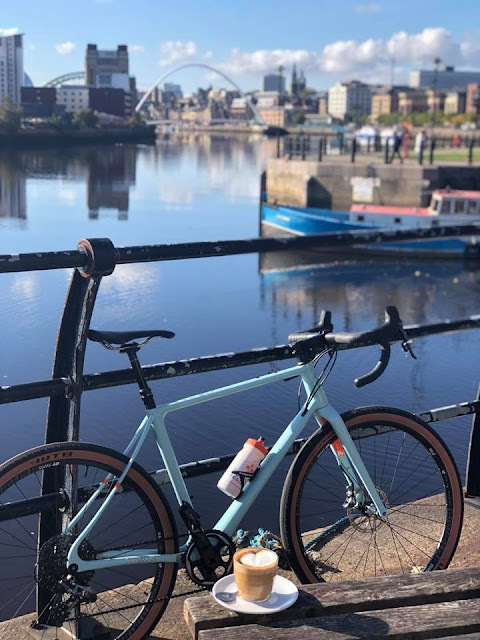 Designed specifically for the British market (and British roads) the V+1 is a performance bike for road riders who want to do it all and on the V+1 you can do it all in considerable style... at a price. Casually loitering behind the ByTheRiverBrewCompany in Wood Camo jersey courtesy of Paria.cc and admiring the details on the V+1 shod with 650b wheels and 47 mm WTB ByWay tyres, a 170mm disc at the front with a 140 at the rear. With the V+1 you can use what ever wheels are best for the ride or race you are doing, a mid-week crit ? stick your deep section hoops in and away you go. The Vielo V+1 pictured at the BackYardBikeShop alongside another incredible local creation, this specially commissioned Geisha inspired artwork was created by an artist called Hush (Instagram @hushartist). Newcastle based Hush who trained as a graphic designer at Newcastle College of Art is world renowned for his contemporary depictions in which he re-invents historical female figures. 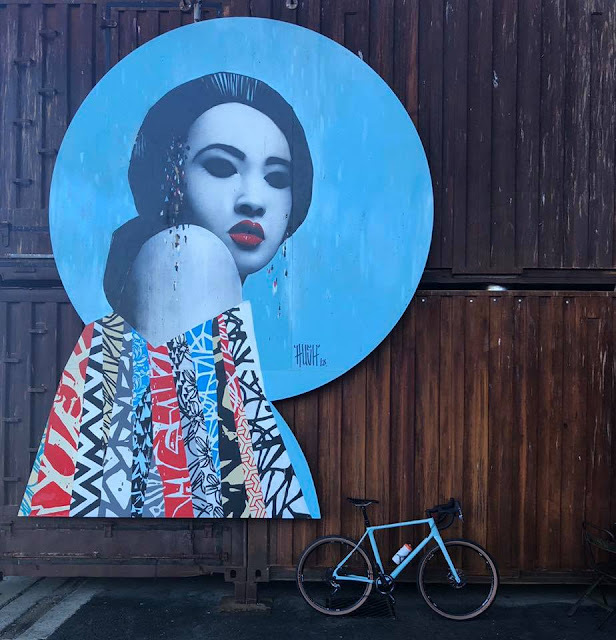 Its quite an artistic coup for the boys at the BYBS to have this piece as Hush was recently included on a list of the worlds top twenty up and coming artists and he has exhibited his work at galleries in Los Angeles, New York, Miami, London and Berlin. Just the best applied bar tape I have ever seen that's all, this silicone tape from fabric doesn't lift as you move your hands across it so it can be applied from the centre out over, meaning there is no need for a wrap of tape in the middle of the bars and check out those Vielo branded headset spacers, and the cable routing, just a few of the really neat details that are every where you look on the V+1. This demo machine was protected by something else that I was really impressed with, invisiFrame it's a shame you can't see it, it's invisible ... obviously. No the chain and cassette are not dirty they are actually sparkling clean, its a SRAM X01 XG-1195 10 x 42 black cassette paired with a KMC DLC11 Diamond Black chain ... very shiny, very black and very expensive ! Keeping the black theme going if you look very closely you will see that the lock nut on the tyre valve is also black and shiny ... because for the detail obsessed the guys at Vielo.cc a silver one just would not do. 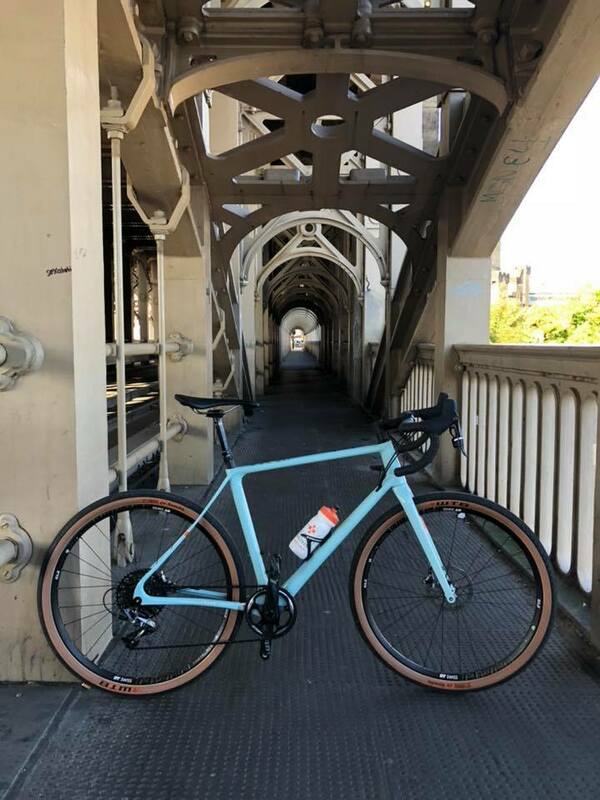 What about those bridge-less seat stays ? more precisely the 'passive rear suspension' and the flattened, up-curved chain stays, absolutely beautiful. The Vielo V+1 a high level bike on the High Level Bridge and to you observant blog readers - yes that's a RockShox Reverb dropper seat post (on a 'road' bike !) 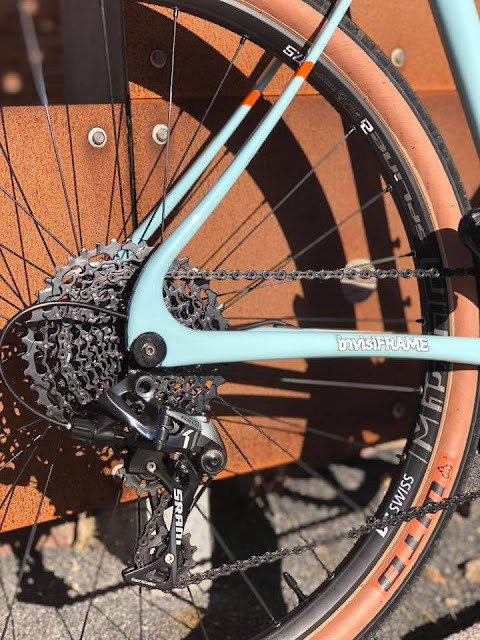 an optional extra that is seamlessly operated from the left hand double tap SRAM shifter allowing you to lower your saddle slightly or give it the full 125mm drop in one go, so trick. Two beautiful birds one beautiful bike, just by chance my day on the Quayside with the V+1 turned in to a bit of an art tour. 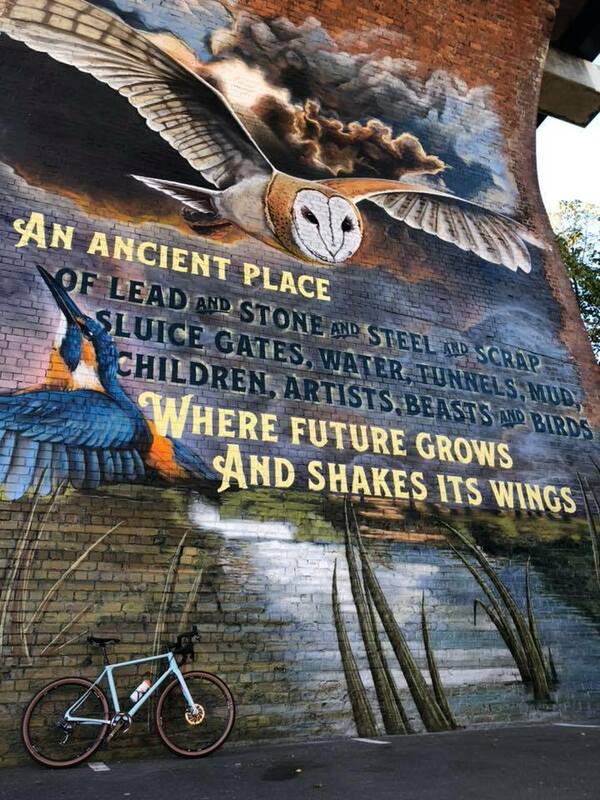 I came across this beautiful piece in Ouseburn, it was created for the recent Great Exibition of the North and it's in a car park under a railway arch, luckily there was nobody parked in front of it when I passed. If you have never visited the Ouseburn Valley in Newcastle its well worth a trip up there, loads to see and do, I really like it. More 'artwork' in Ouseburn, or is it just graffitti ? I think the difference between the two is simply permission, with permission traditional painted graffitti becomes a form of public art. There are lots of good examples of it in Ouseburn and I was spoilt for choice of places to lean the V+1 to take pictures, I took this one with the IPhone on a tripod, in case you were wondering. Not too difficult to get good pictures of the V+1 with fantastic weather and the beauty of the Newcastle quayside. My final stop of the day just a couple of minutes pedal from Ouseburn was the Cycle Hub right on the riverside. I have been to the Hub a few times, it's in a great location, there's always a nice friendly atmosphere and they sell good coffee. On such a fabulous day there were loads of cyclists enjoying the weather and the V+1 attracted a lot of attention, even with its fairly low key colour scheme people seemed to immediately realise that it was something very special. So how good is the Vielo V+1 ... really ? well I only had the bike for a few hours and during that time I was a bit distracted trying to take in all the details and getting the pictures for today's blog. 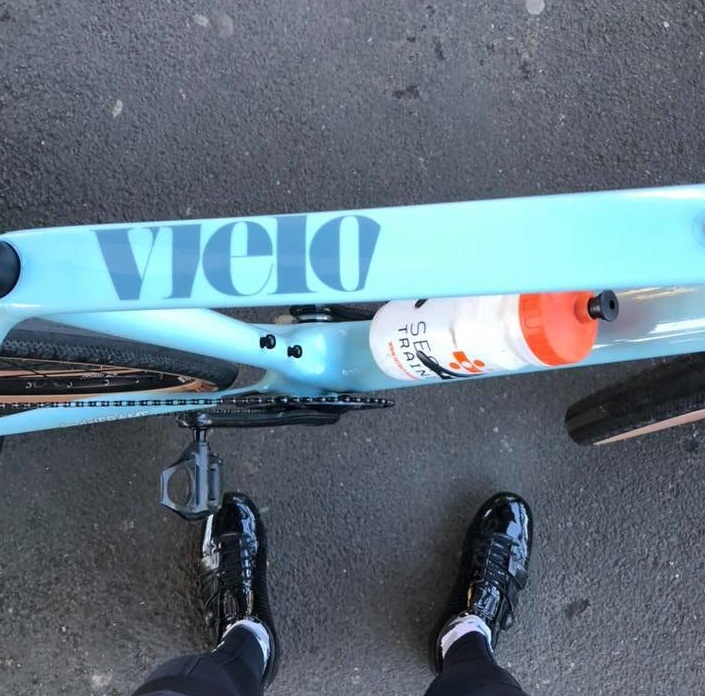 Though on the half hour ride back to Vielo HQ to return the bike I gave it a little bit of a test and rode it hard on the road, on cycle paths and over cobbles and I loved it ! its an absolutely brilliant machine, but don't just take my word for it.